Help your preschoolers and kindergartners learn the alphabet and numbers while you encourage reading and books with the Animals and Shapes book kits. 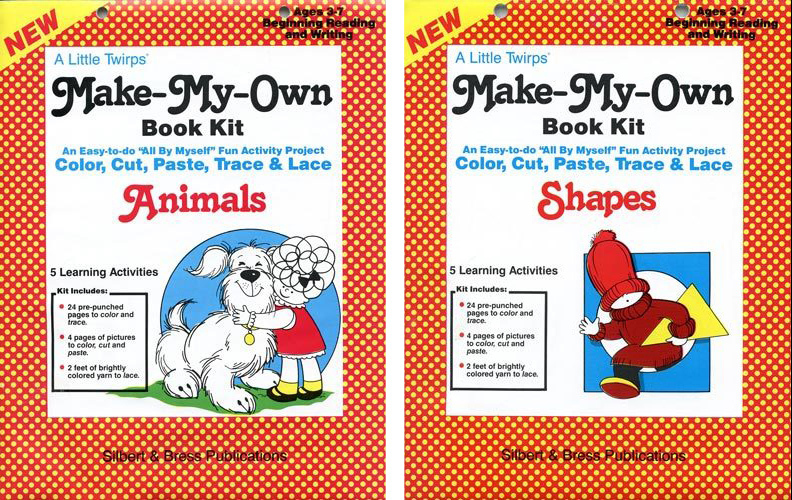 They're two of seven Make My Own Book Kits, by Linda Silbert, PhD and Al Silbert, EdD. Kids color, cut, paste, trace, and lace their own children's books with little or no help. A wonderful introduction to numbers and letters of the alphabet. Their self-esteem grows when parents and preschool teachers share the excitement of their finished project. Parents, preschool and kindergarten teachers find these easy-to-do-all-by-yourself book kits an excellent resource to introduce young children to books and reading. Your preschooler will be delighted with this fun activity and then want to make all 7 books in the Make My Own Book collection. Pick up the "Animals and Shapes Make My Own Book Kits" for your preschool or kindergarten kids today. Dimensions: 8 1/2" x 11". Each comes complete with brightly colored yarn. Quality paper with pre-punched holes to make a 24 page finished book. You supply scissors, crayons and paste..